Fort Boards Wins Tillywig Toy Award Gold - "Ingenious Construction Toy"
Fort Boards has won a lot of awards so far and we're proud of each one. But the Tillywig Toy Awards are very prestigious and we're very excited to have won gold in the Top Fun category. 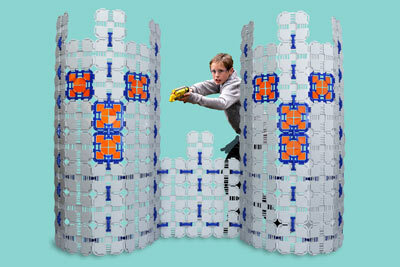 Check out their review on Fort Boards to hear what they think of this "ingenious construction toy". One of the great things about building something with your child is that you enjoy it as much as he or she does. Fort Boards are no exception. They’re delightfully simple. Fort Boards is now an educational toy "as seen on TV"! August Graube, the founder of Fort Boards, was invited on to the King 5 show New Day Northwest to talk about our fort building toy. What a great experience! "But then the strangest thing happened. I discovered that building giant forts is fun… for adults too. Not only do the kids love it, but it’s a great activity for us to do together!"